from the series "Tracking Gandhi"
To mark what would have been Mahatma Gandhi’s 150th birthday, Galerie m Bochum is showing from December 7th 2018 to April 27th 2019 a solo exhibition of works by Anja Bohnhof. 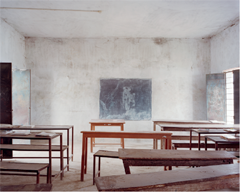 For her series Tracking Gandhi, the Dortmund-based photographer (b. 1974 in Hagen) followed in the geographical footsteps of this visionary and resistance fighter, traveling to many different places in India, South Africa, and Europe that were important for his life and work. 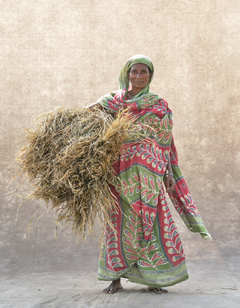 The portrait groups Krishak, Mohila, and Bahak, which show rice farmers and harvest workers in West Bengal as well as porters in Kolkata (Kalkutta), then direct our attention to further – to life in present-day India. The show features a small selection of the 80 or so images in the series Tracking Gandhi, which Anja Bohnhof worked on from 2013 to 2018. This extraordinary project took a great deal of perseverance and effort on her part, not least because of the elaborate procedures that were sometimes necessary to obtain approval to make photographs. The results offer numerous starting points for an examination that goes far beyond biographical aspects alone. Accompanying texts meld the visual impressions to create a story that provides insights into Gandhi’s political commitment and social action. Along with their documentary quality, the photographs are each charged with a compelling push and pull between contemporary aspects and a historical aura. 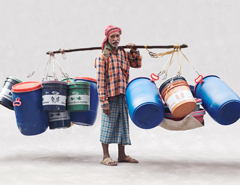 The portrait series Bahak, Krishak, and Mohila were produced in a mobile studio that Anja Bohnhof set up in the streets of Kolkata and the rice fields of West Bengal. The subject’s faces, clothing, and attributes stand out in sharp relief against the neutral backdrop, intensifying our perception of facial expressions, posture, patterns, and colors. Bohnhof’s portraits show these people in a respectful and unobtrusive, and yet unabashed manner. She portrays them as individuals, steering our attention to the smallest details. Studying this portrait series in combination with Tracking Gandhi imparts a deeper understanding of what it means to be human.